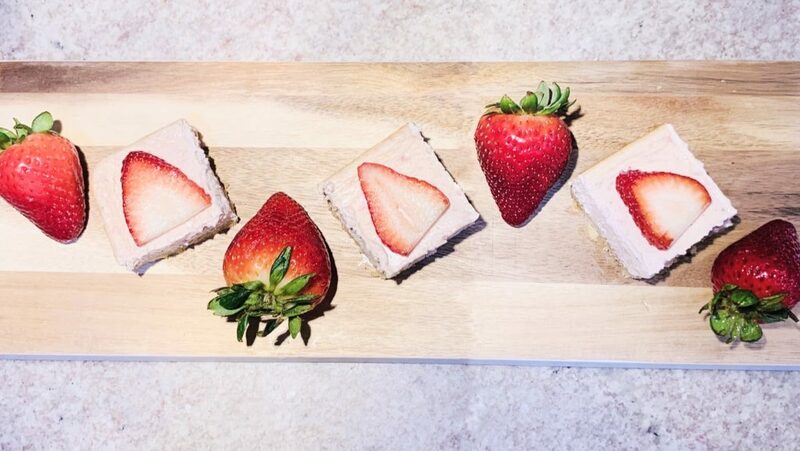 Sweet, creamy and full of refreshing strawberry flavor, these Keto Strawberry Cheesecake Bars are the perfect dessert for your next Spring celebration, or anytime you want. Spring is here. Flowers are starting to bloom outside and the weather is warming up. As the world renews and blooms outside, I start thinking about serving some refreshing dishes with the beautiful colors and flavors of spring. 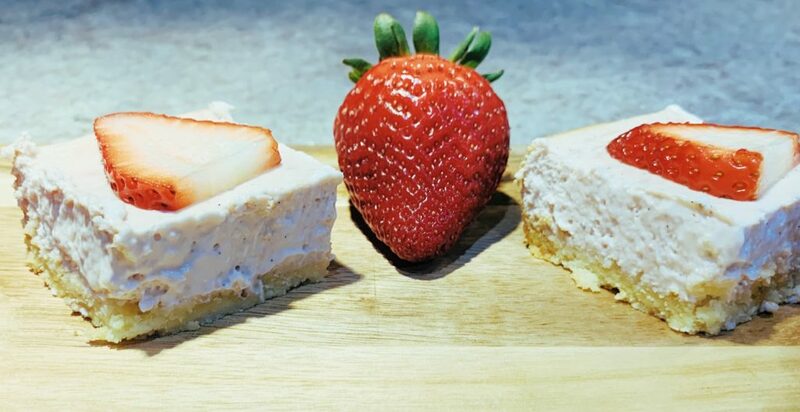 These Keto Strawberry Cheesecake Bars have the same base as my Low Carb Pumpkin Spice Cheesecake Bars with a refreshing Spring twist. Strawberries are one of my favorites fruits. The perfect blend of sweet and tart. My kids love them too. If I don’t specify how many they can eat, the girls will finish off an entire container in one sitting. Strawberries are a great low-carb option too. 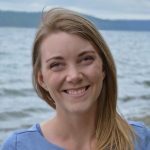 When big juicy strawberries started showing up in my grocery store, I knew I had to make a delicious dessert with them. 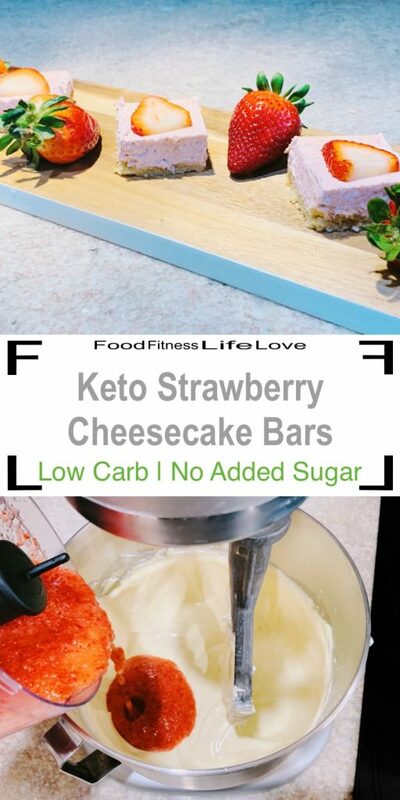 The base of these Keto Strawberry Cheesecake Bars, is an almond flour crust. Simply mix together almond flour, melted butter, and sweetener (I like a stevia / erythritol blend) until the mixture is combined and moist. I mix mine right in the baking pan to save on dishes. 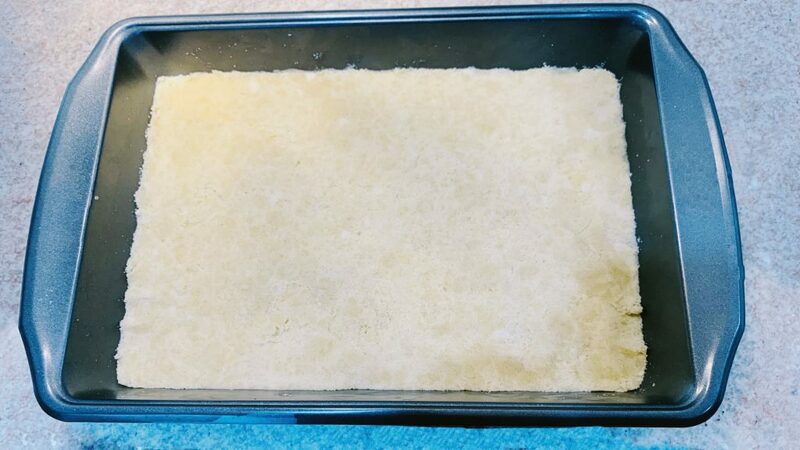 Once the almond flour mixture is moist, press it into an even layer in the bottom of a 9″ x 13″ baking pan. Bake at 350 degrees until golden. After the crust is done, turn the oven down to 275 degrees. 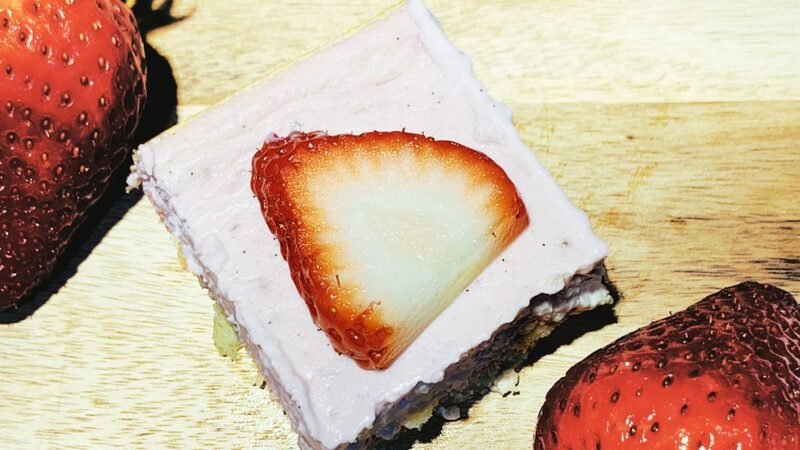 To create the cheesecake filling, start by creaming together cream cheese, liquid stevia and vanilla bean paste. I was introduced to vanilla bean paste a few years ago. It adds extra vanilla sweetness to so many dishes. Plus, you get those beautiful vanilla seeds. You can buy vanilla bean paste online, but I usually find mine in the specialty food sections of stores like Home Goods or TJ Maxx. If you don’t have vanilla bean paste, vanilla extract will work too. 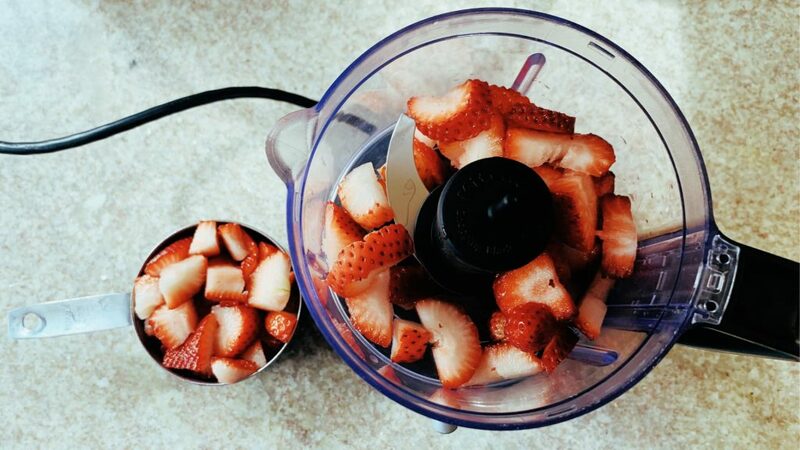 While the cream cheese is creaming in the mixer, use a food processor to puree the strawberries. You could also use a blender or dice the strawberries small and mash with a fork. 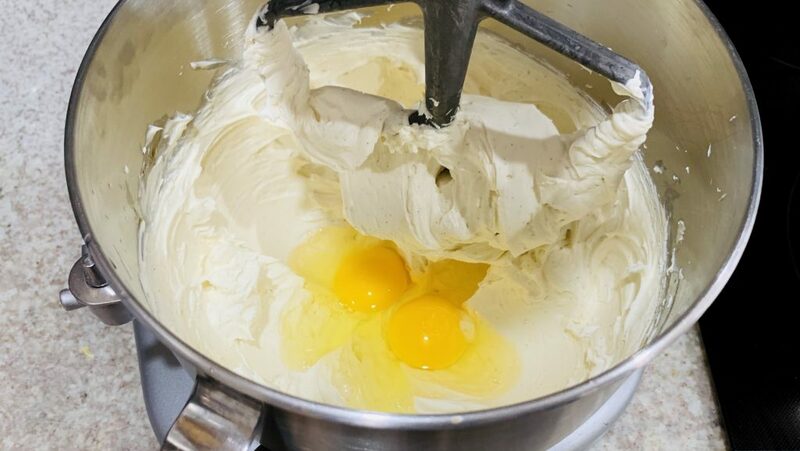 When the cream cheese vanilla mixture is nice and smooth, add eggs and heavy cream to the mixer. Continue mixing until the cream cheese filling is velvety smooth, scraping down the sides of the bowl as necessary. Finally, add the the strawberry puree once the filling is smooth and creamy. Mix the strawberry cream cheese filling one last time, until all the ingredients are thoroughly combined. 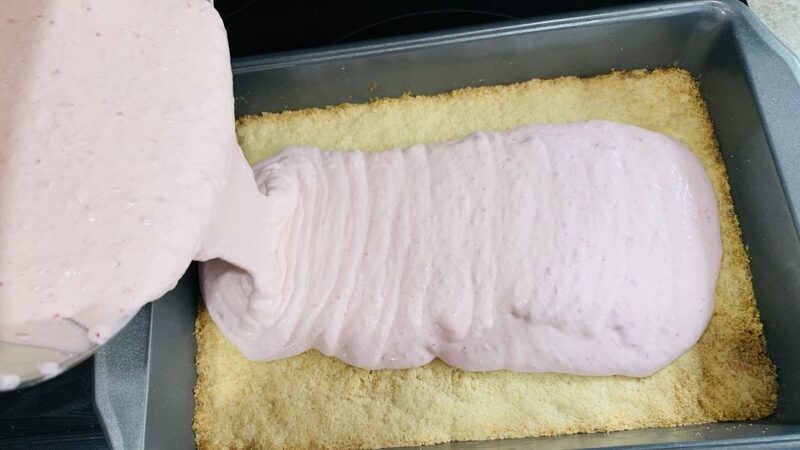 To finish off the Keto Strawberry Cheesecake Bars, pour the filling on top of the cooled crust. Smooth out the filling and tap the pan on the counter to make a nice even layer on top of the golden crust. 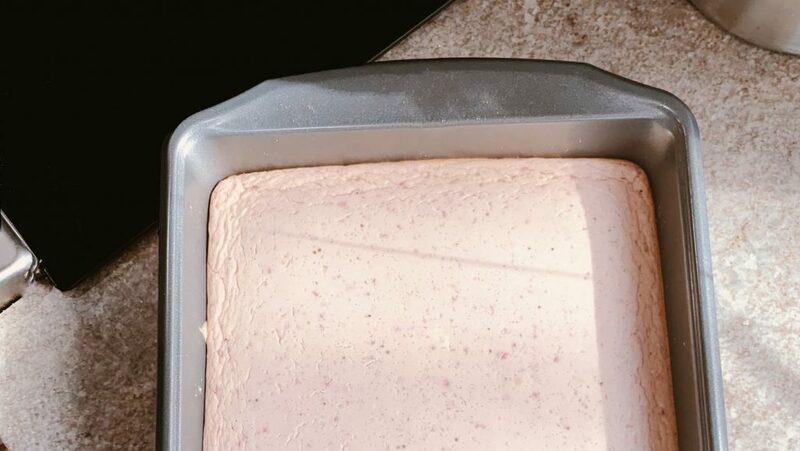 Bake the Strawberry Cheesecake Bars until they are mostly set, but still slightly giggly in the center. Let them cool to room temperature, and then refrigerate for at least 3 hours. To be honest, my family was so excited about these bars, we just couldn’t wait. After dinner, we tried them, after about 2 hours in the fridge. They were absolutely delicious, but not quite set all the way. However, then next day, the bars had a perfectly creamy and fresh strawberry cheesecake filling on top of a delicious, sturdy crust. Aren’t these bars the most beautiful shade of blush pink? They remind me of the flowers outside. 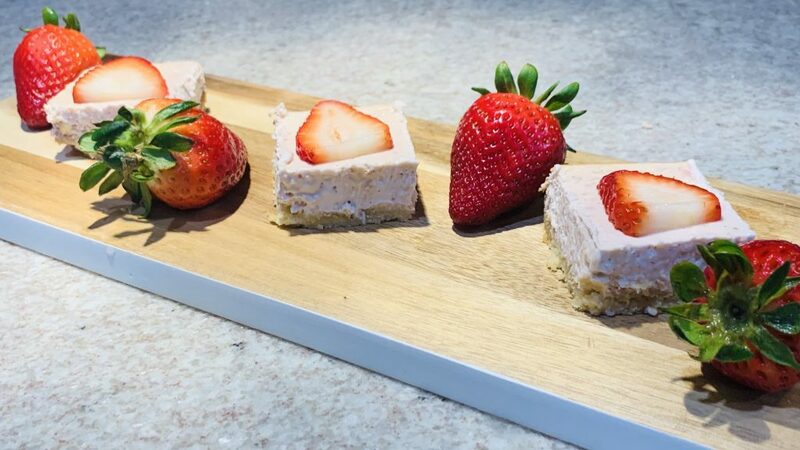 With a lovely, refreshing strawberry flavor, Keto strawberry Cheesecake Bars are perfect for your next gathering. Or a great way to celebrate Spring with your family. Pre-heat the oven to 350 degrees. 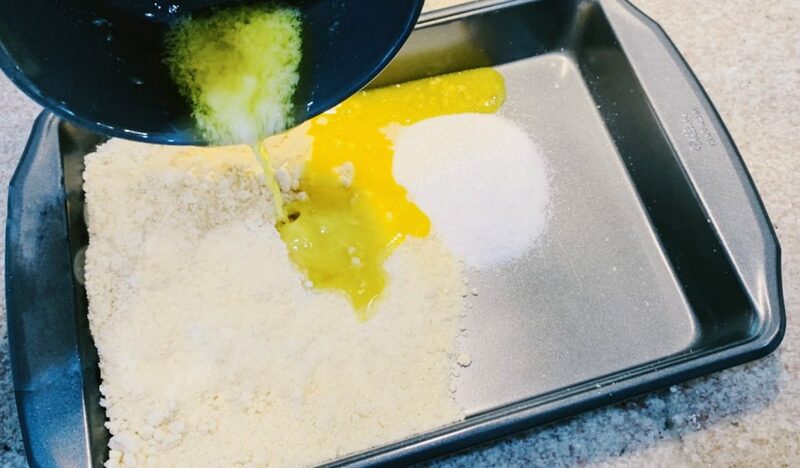 Mix together the almond flour, melted butter, and Splenda Naturals (or other granular sweetener). Once the almond flour mixture is moist and thoroughly mixed, press into an even layer on the bottom of a 9″ by 13″ pan. Bake the crust for 12 minutes until golden. After the crust is golden, remove from the oven and let it cool. Turn the oven down to 275 degrees. 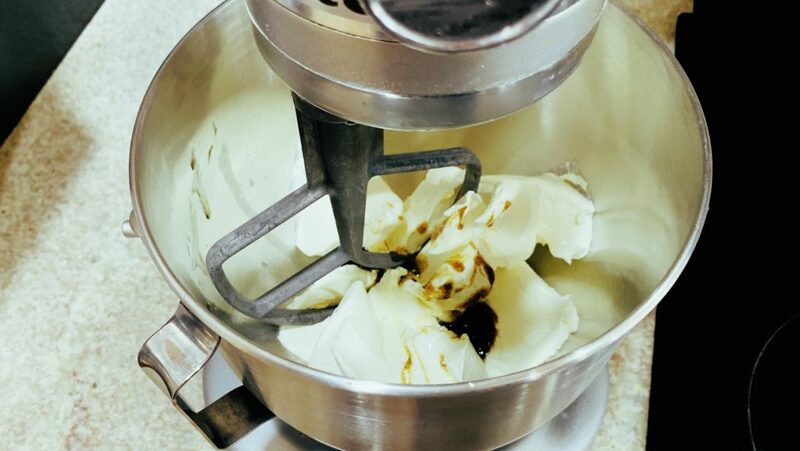 In a mixing bowl, cream together the cream cheese, vanilla bean paste, and liquid stevia until smooth. Add in the eggs and heavy cream, and mix until smooth. 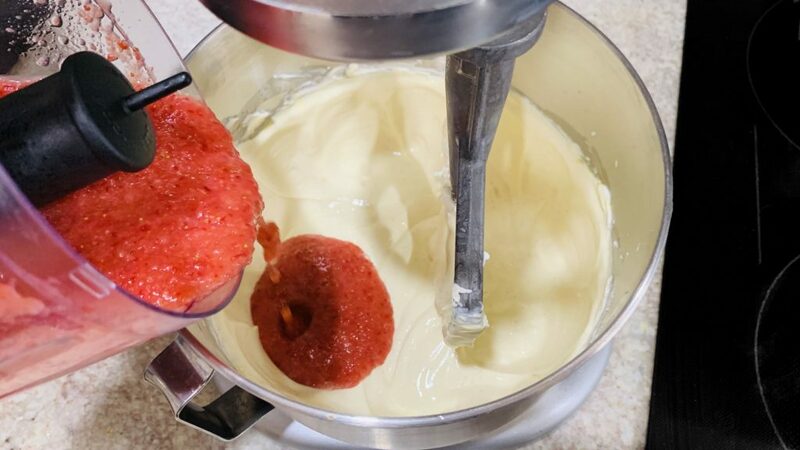 While the cream cheese mixture is mixing, puree the sliced strawberries in a food processor. 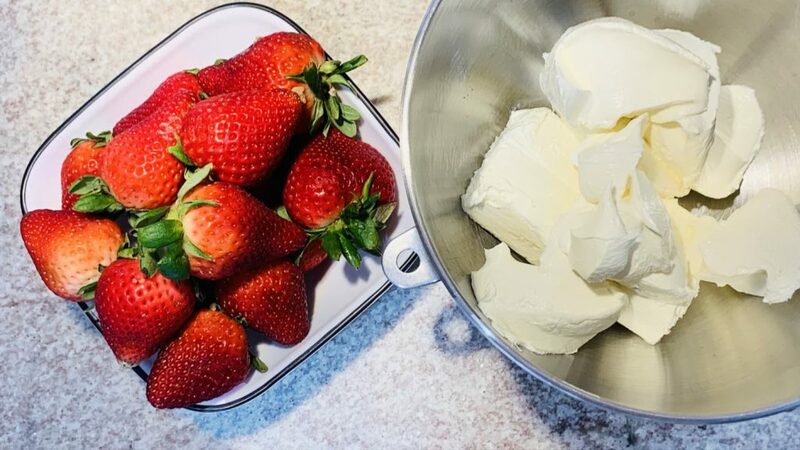 Add the pureed strawberries to the cream cheese mixture. Mix, scraping down the sides as necessary, until the filling is smooth and all the ingredients are fully incorporated. Pour the strawberry cheesecake filling on the cooled crust. Smooth out the filling and tap the pan on the counter top to get the filling level. Bake at 275 degrees for 40 minutes. When the cheesecake bars are done cooking, the filling should be mostly set but a little jiggly in the center. Allow the bars to cool to room temperature, and then refrigerate for at least 3 hours. Cut into 24 bars and serve.